Art on the Square — Friday, Saturday, Sunday. Public Square, Belleville. Fine art fair featuring vendors, music, kid's activities and more. See the full schedule each day of the festival at bnd.com. St. Jacob U.C.C. 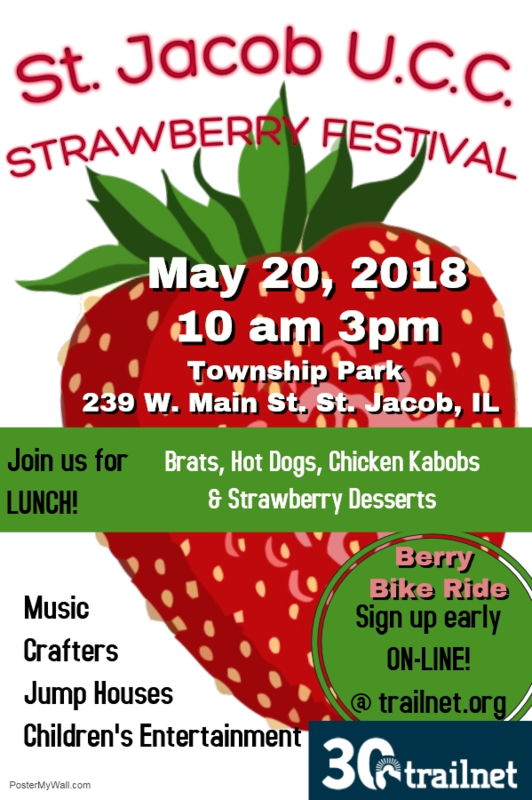 Strawberry Festival — 10 a.m. to 3 p.m. Sunday. Township Park, 239 Main St., St. Jacob. Featuring music, crafters, jump houses, and children's entertainment. 5th Annual Celebrate Cahokia — 1 to 4 p.m. Saturday. Cahokia Park, Cahokia. Featuring live music, fire truck on display, free popcorn, snow cones, cotton candy, bounce house, attendance prizes. Bring a lawn chair or blanket. The Jarrot Mansion will be open for free tours. Sponsored by the Cahokia Connections Church Alliance. Touch-A-Truck Community Fair — 9 a.m. to noon Saturday. Belleville West High School, 4063 Frank Scott Parkway West, Belleville. Sponsored by the Metro East Chapter of the Illinois Association for the Education of Young Children. Free event featuring different types of transportation vehicles to explore. Free Hepatitis C and HIV Tests — 9 a.m. to 3 p.m. Friday. Health Department, 19 Public Square, Belleville. Offered by the St. Clair County Health Department. All tests are confidential. Information: 618-825-4471. Stookey Post 1255 American Legion Annual Flag Retirement Ceremony — 2 p.m. Saturday. Stookey Post, 201 Eiler Road, Belleville. Master of ceremonies: Col. James T. Pratt III, U.S. Army, retired. The public is invited and refreshments will be available. Old Town Farmers' Market — 7:30 a.m. to noon Saturday. First block of South Charles between East Main and East Washington Streets, Belleville. Featuring seasonal locally grown produce, meat, honey, baked goods and more. Free children's activity and acoustic music by Gavin McNutt from 9 a.m. to noon. Swansea Farmers Market — 11 a.m. to 3 p.m. Thursday, May 17. Rural King parking lot, 2801 N. Illinois St., Swansea. Diva's Night Out — Register 5 to 7 p.m. Thursday, May 17. Eckert Florist, 201 W. Main St., Belleville. Cost $5. Stroll, sip and shop to Big Daddy's by 8 p.m. to win prizes. Portion of the proceeds support the 9/11 Memorial. Maryville Farmer’s Market — 4:30 to 7:30 p.m. Thursday, May 17. Drost Park, 8 Schiber Court, Maryville. ‘Come as You Are’ Tai Chi — 5 p.m. Wednesday. Ever and Anon Park, corner of East Main and Mascoutah Ave., Belleville. Free one-hour class for all ages and skill levels. Sponsored by the Belleville Heritage Society. Millstadt Farmer's Market — 3 to 6 p.m. Friday. Veterans of Foreign Wars parking lot, W. Washington St., Millstadt. Mid-Illinois and Southern Illinois Iris Societies: Annual Spring Iris Show — Entries received 8 to 10 a.m. Judging 10 a.m. to noon. Saturday. Caseyville Township Hall, 10001 Bunkum Road, Fairview Heights. No charge to the public. Specimens on display from noon to 4 p.m.
Buck Road Cemetery: Annual Memorial Day Service — 2 p.m. Sunday. Buck Road Cemetery, Maryville. The public is invited. 199 veterans are buried at the cemetery. Oaklawn Cemetery: Memorial Day Service — 12:30 p.m. Sunday. Oaklawn Cemetery, Glen Carbon. The service will include a reading of the names of all veterans buried at Oaklawn. All interested persons are welcome. Bring a lawn chair. 2018 National Emergency Medical Staff Week Softball Game — Noon, Saturday. Granby Park, Illinois 2550 N. 44th St., Fairmont City. Medical professionals from the community will play softball. The public is invited to watch, enjoy food and drinks. Boy Scout Troop 30 Barbecue — 11 a.m. to 5 p.m. Saturday. Rural Family Medical Parking Lot, 251 Marketplace Drive, Freeburg. Pork steaks, brats, hamburgers, homemade sides. Swansea Fish Stand — 11 a.m. to 8 p.m. Friday and Saturday, 216 Service St., Swansea. Cod, walleye, catfish, shrimp and more. Saturday: fried chicken. 618-222-7171. Turkey Hill Grange barbecue — 4 to 7 p.m. Every Thursday through Sept. Turkey Hill Grange, 1375 E. Illinois Highway 15, Belleville. Featuring pulled pork, pork steak and brats. Proceeds benefit community service projects. Carryout or eat in. Optimist Club of Belleville — 6 p.m. Tuesday. Bellecourt Place, 120 N. Jackson St., Belleville. Program: recognizing the youth winners of the Poster, Oratorical and Essay contests. Dupo Classmates and Friends Lunch Bunch — 11:30 a.m. Thursday, May 17. Aunt Maggie's Restaurant, 230 N. Main St., Columbia. Benefit Recital for Jenny Rea — 7 p.m. Friday. First United Presbyterian Church, 1303 Royal Heights Road, Belleville. Jenny Rea, a student at Murray State University, will perform a vocal recital. Free will offering will be taken to support Rea's study abroad in Lucca, Italy. John Waite: Wooden Heart Acoustic — 7 p.m. Sunday. Wildey Theatre, 252 N. Main St., Edwardsville. Tickets: www.wildeytheatre.com or 618-307-1750. "A Walk Down Broadway" — 7 to 9 p.m. Saturday; 2 to 4 p.m. Sunday. Jacoby Arts Center, 627 E. Broadway, Alton. Tickets $10. Available at www.jacobyartscenter.org/tickets or at the door. Alton Little Theater: Camelot — 7:30 p.m. Thursday, May 17, Friday, Saturday; 2p.m. Sunday. Alton Little Theater, 2450 N. Henry St., Alton. Admission: $17 adults, $10 students. Tickets: 618-462-3205. Holy Dormition Orthodox Parish: lunch to go — 11 a.m. to 3 p.m. Saturday. Holy Dormition Orthodox Parish, 300 N. 4th St., Benld. Dinners $9. Beef stroganoff, nut and poppy seed rolls, stuffed crepes and more for sale. Pre-orders, call or text: Debbie Spears, 217-313-6522 or Tatyana Meiekord, 217-720-5099. Cahokia Day at the Jarrot Mansion: Open House — 1 to 4 p.m. Saturday. Intersection of Illinois Route 3 and Illinois Route 157, Cahokia. One of the oldest brick buildings in Illinois, the home was built in 1810 by Nicholas Jarrot, a refugee from the French Revolution. The mansion is administered by the State of Illinois. Elsah Spring Festival — 10 a.m. to 5 p.m. Saturday and 11 a.m. to 4 p.m. Sunday. Featuring arts and crafts vendors, food vendors, musicians, historic building tours and walking tours. For a full schedule of events and vendors: www.escapetoelsah/events or 618-374-2821. Monroe County Farmers Market, Columbia — 3 to 6 p.m. Thursday. Schnucks parking lot at 100 Columbia Center, Columbia. Monroe County Farmers Market, Waterloo — 7:30 to 11 a.m. Saturday. The Family Video parking lot, 100 Plaza Drive, Waterloo. Nashville Chamber of Commerce Farmers Market — 7 to 11 a.m. Thursday. In front of the Washington County Courthouse, 163 East St. Louis Street, Nashville. National "Run for the Wall" motorcycle ride — 12:30 p.m. Tuesday. Mt. Vernon. More than 500 bikers will re-fuel and proceed down Broadway to the Mt. Vernon Outland Airport for a donated luncheon. The public is encouraged to line Broadway Street with flags and join the bikers at the airport. Sparta Farmer's Market — 1 to 5 p.m. Friday. Broadway and St. Louis Streets, Sparta. Visit the market's Facebook page for updated information. Farmers' and Artisans' Market — 8 a.m. to noon Saturday. Corner of Landmarks Blvd. and Henry Street, Alton. www.downtownalton.com or 618-463-1016. 2018 Whitaker Music Festival: Free evening concerts — 7 p.m. Wednesday, May 23. Missouri Botanical Garden, 4344 Shaw Blvd., St. Louis. Gene Jackson performing. Kiener Kids presented by Centene Charitable Foundation — 9 to 11:30 a.m. Saturday. Kiener Plaza, St. Louis. Yoga Buzz yoga session for all ages at 9:30 a.m. and then live storytellers take the stage. Register: www.archpark.org/event/kiener-kids.